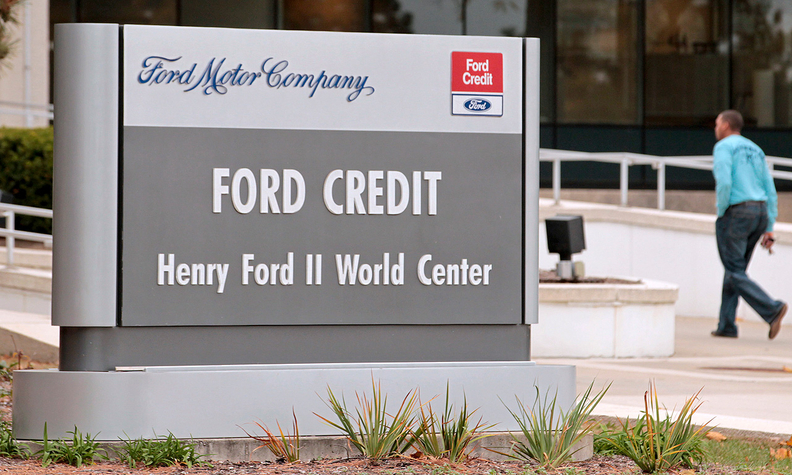 Ford Credit's first-quarter losses for bad loans were only 0.22 percent of total outstanding loans. Ford Motor Credit Co. increased its share of U.S. retail loan and lease volume for Ford and Lincoln dealers to 45 percent in the first quarter. That was up from 44 percent a year earlier and the highest first quarter in 14 years. The first-quarter share also was the second-highest share for Ford Credit since the third quarter of 2014, when share was 53 percent, the company said last week during a conference call. The captive finance company’s share typically peaks for the year in the third quarter, tied to model-year changeover, incentives on outgoing models and greater spending on marketing and advertising. Ford Credit’s pretax profit was $483 million in the first quarter, down 3.2 percent from $499 million a year earlier. Net income was $108 million, up 4.9 percent from $103 million. Ford’s captive finance arm reported volume was up, offset by slimmer margins and unfavorable foreign currency exchange. In the U.S., loan and lease contract originations combined were 295,000 in the first quarter, up 4 percent from the same quarter a year earlier. In the first quarter, Ford Credit losses for bad loans were only 0.22 percent of the total outstanding. That was an increase from 0.20 percent a year ago but well below the 10-year average of 0.40 percent, CFO Mike Seneski said during the conference call. “We continue to experience historically low credit losses,” he said. Seneski also said he sees no issues developing in subprime auto loans, either for Ford Credit or for the industry in general. He said Ford Credit has maintained a steady 5 to 6 percent of its retail loans and leases in what the company considers the high-risk category, defined by credit scores and other factors. For the industry at large, Seneski cited credit rating agency and credit bureau reports that origination volume and delinquencies are “under control” in subprime. “We don’t think there’s much of a story,” he said, regarding subprime problems.